I've seen quite a few posts on Facebook from people who want to know how to get started in a Business Analysis career. There seems to be some confusion and some misconceptions about this. 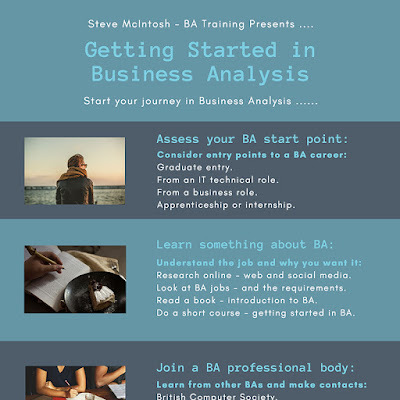 So I've started on producing what I hope will be some useful info for aspiring Business Analysts. Update - my course Getting Started in Business Analysis is now live and online. 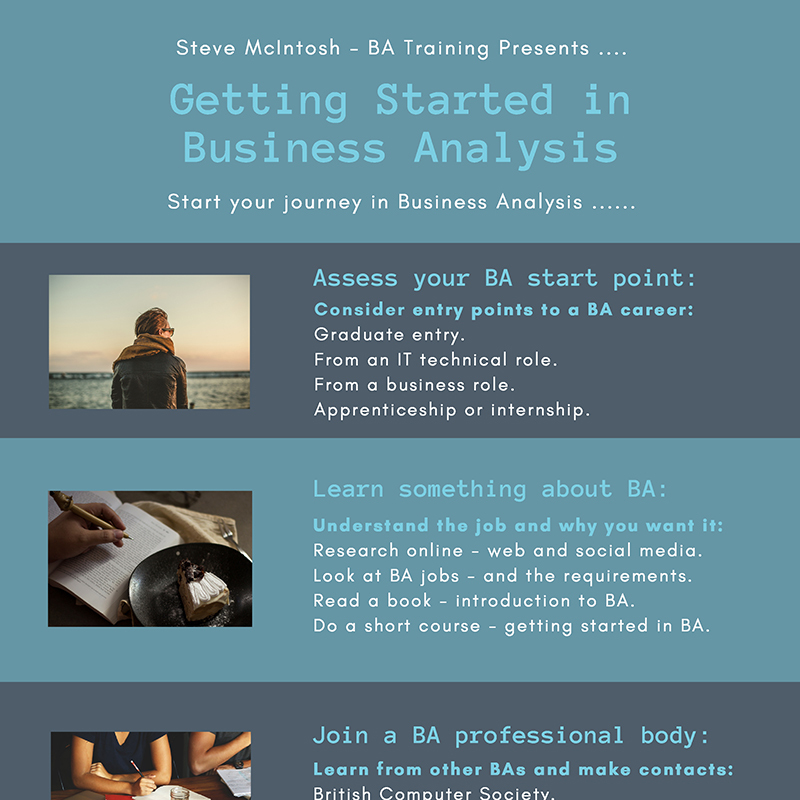 First - an InfoGraphic - Getting Started In Business Analysis - that covers some of the key points. A sample of this is above and the full graphic is at the foot of this post. One of the key points that I've covered is BA Starting Points. One misconception seems to be that you have to have an IT / technical background to get a job as a Business Analyst. This is not true. It may be a requirement for some BA jobs - but for many it is not. It is fairly common for BAs to be recruited from a business role. Another misconception is that specialist business domain knowledge is needed - for example Financial Services or Logistics. Again - this is not true for all BA roles, especially at entry level. I'll be writing a series of blog posts on this subject to add more and answer a few more questions. I'm also working on a short training course - aimed at getting aspiring BAs on track. The content will be based broadly on the content of the InfoGraphic. 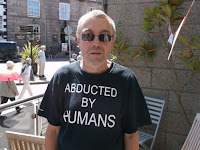 More on that as well in due course. A few links that you might find interesting and helpful. More on this coming soon - and if you have any questions - please post them in the Comments section below.